International Commercial Airline Stretcher Services is an option when your loved one becomes ill or injured abroad. The service is a tremendous cost savings over air ambulance services , yet still provides the highest level of comfort for the client's. Our Flight Coordinators work directly with the airline to insure that the plane is prepared for the trip. 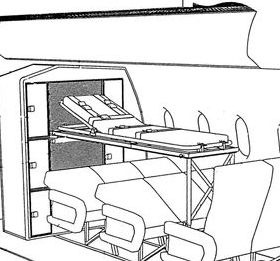 The airline will remove several rows of seating in the back of the plane to allow for a regulation Air medical stretcher and all necessary equipment. Additionally, the staff coordinates and manages all aspects of the flight, ticketing, obtaining visas if necessary, arranging for all ground transportation, clearing the transport with government agencies and scheduling.